Ummm…hello? It’s been radio silent here on this blog for almost a month. How embarrassing, but I just haven’t been baking much lately. We went to the beach (and didn’t want to come back). Then when we did come back, I was given what I can only assume was a punishment schedule at work for having taken (unpaid!) vacation time. But, now I’m back in the game, and with rhubarb no less! 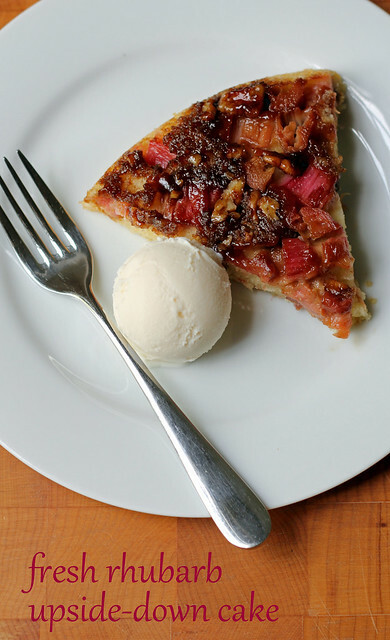 I tried really hard to find local rhubarb to make Johanne Killeen’s Fresh Rhubarb Upside-Down Cake. I feel like it should be around these parts by now, but after striking out at three different farmers’ markets, I stopped wasting my time (and MetroCard swipes) and just got a few stalks from the grocery. This recipe is intended to make several little baby cakes, but I just baked it off as one big mama in a cast iron skillet. It wasn’t super goopy so it wasn’t too scary to flip out of the skillet. Dark brown sugar gives this upside-down topping real character, and crème fraiche makes the cake batter extra tender. I threw a splash of vanilla into the batter, too, which maybe wasn’t totally necessary since it wasn’t called for in the recipe…and since I had vanilla ice cream with it anyway…but whatevs. I can see this also being a tasty base recipe for stone fruit or even mango upside-down cake. For the recipe, see Baking with Julia by Dorie Greenspan or read Erin’s When in Doubt…Leave it at 350. It’s also here. Don’t forget to check out the rest of the TWD Blogroll! Hmm..my recipe had two teaspoons of vanilla stirred into the sour cream/creme fraiche. I’d say it was a good thing to add. This one is a delicious one. What a fabulous looking upside down cake – I love the colour! rhubarb is so beautiful to bake with. this looks delicious! You were dedicated to try at the market for rhubarb – I had no qualms about just picking it up with the groceries, even if it wasn’t the greatest rhubarb around. Beautiful cake! Vanilla is always a good thing. I have a rhubarb plant in the back yard that is going crazy so this was fun. A delicious cake with many variations. I’ll certainly make it again. I had trouble finding local rhubarb too. Your cake looks great…baking this in a cast iron skillet is a good idea. Your cake looks great. It is too early here for rhubarb, so I had to use mangos….but I can’t wait to try this with rhubarb soon. So gorgeous…and perfect with a scoop of vanilla! Love your photography, the cake looks delicious. Rhubarb doesn’t seem to be in season here yet so we opted to use pears poached in white wine instead. Yep – mango! My thought exactly. Your cake looks great, and why can I not ever get that perfect ball of ice cream!?! Looks delicious and your ice cream serving is a perfect sphere!